Postcard US-2545772 from Virginia, USA shows a Little Free Library that the sender set up in front of her house. A Little Free Library is a “take a book, return a book” gathering place where neighbors share their favorite literature and stories. In its most basic form, a Little Free Library is a box full of books where anyone may stop by and pick up a book (or two) and bring back another book to share. It started in 2009 when Todd Bol of Hudson, Wisconsin, built a model of a one room schoolhouse as a tribute to his mother, a former school teacher who loved reading. He filled it with books and put it on a post in his front yard. 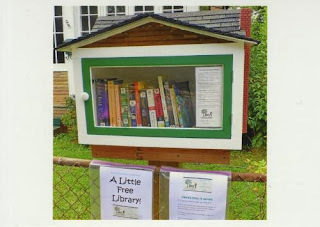 It now grows into a network of more than 10,000 registered Little Free Libraries in the world. The concept of Little Free Library is unique as real people are sharing their favorite books in their community with a carefully curated collection, and the Library itself is a piece of neighborhood art. You can find a Little Free Library near you on a map, and learn how Little Free Libraries work in 2 minuets.